People use roses to make tea, but not the whole flower, just a very special part that’s called the rosehip. Did you know that there are a lot of different flowers that you can make tea with, using plants from your own garden? What Are Rose Hips Also Used For? What is Rosehip Good For? Ranging from orange to red and even purple to black in some varieties, rose hips are the fruit that are left behind after the rose petals fall off. The flower of the rose plant is pollinated in spring or early summer, then the hips ripen by late summer through autumn. Roses are grown from the seeds inside the rose hips. 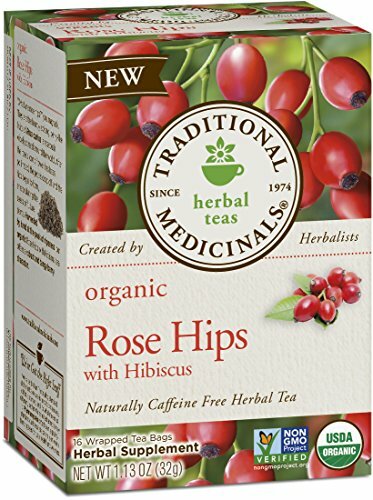 Rose hip tea is made from the dried hips, which be cut, processed or left whole for brewing, although a good cup of tea comes from cut pieces which allows for the flavors and benefits to be released into the tea faster. Apart from tea, the hips are used to make jams, jellies, syrups, pies, marmalade, wine, bread and even a soup that is popular in Sweden. They can also be eaten raw, but the hairs inside the fruit need to be avoided. Vitamin C with rose hips is the main reason for its popularity and the history of usage for this benefit goes way back, from ancient Rome to current times. The medicinal properties and flavor of rose hips is popular in Chinese history, for treating kidney and urinary problems. In India, rose hips are used in Ayurvedic medicine for enhancing mental faculties. During WWII in Britain, access to citrus fruits was scarce, so Vitamin C with rose hips was a useful and readily available way to ensure good health. Other uses to consider when asking the question “What is Rosehip good for?” have nothing to do with tea or food items. Itching powder is made from the fine hairs inside rose hips and the dried hips are used for creating primitive or tribal crafts, pot-pourri and hand-made fragrances. Along with being a great source of Vitamin C and iron, Rosehip tea also contains flavonoids, calcium, magnesium, potassium, sodium and zinc to name a few and other Vitamins such as A, B complex, D, E, K and P.
Boosting the Immune System – this is where the Vitamin C content kicks in, strengthening the immune system and fighting bacteria and viruses. It can help guard against the flu, clear congestion and clean the respiratory tract. Improving vitality and longevity – when drunk on a daily basis, the antioxidants in this tea can help with the regeneration of new cells, tone the muscles, heal tissues and slow down premature ageing. Detoxifying the body – the anti-inflammatory actions from the presence of Vitamins A and B help clear toxins and treat swelling and pain associated with arthritis. Dealing with Stomach Problems – this tea can relieve stomach spasms, help with acid deficiency, alleviate diarrhea, reduce the occurrence of ulcers and can be a great tonic for issues with bile flow and bowel regulation. Alleviating Stress – as a natural and gentle herbal sedative, rose hips contain anti-depressant properties and can relieve stress and anxiety as well as increase nerve strength, fight fatigue and headaches. Relieving Urinary Tract Infections – this tea is a kidney cleansing tonic. It can break up and prevent kidney stones and the diuretic actions increase the flow of urine and alleviate bladder infections. There are many other ways rosehip tea can help with medical issues and it’s a delicious way to ensure good health, however you might want to test yourself by taking only a small sip before delving straight into drinking this tea, in case you have an allergic reaction. And of course, don’t rely on tea to treat any illnesses, it’s important to visit your doctor if you’re having any health concerns. Never drink a cup of tea as a replacement for medical attention. If you like to make your own herbal teas from scratch, you can create your own rose hip tea recipe by buying dried rose hips from any reputable source and blend them yourself. If you like gathering rose hips from your own rose bushes (making sure that the garden and the roses haven’t been treated with chemicals) you can dry them before blending. If using your own or bought hips, don’t process them too finely, as they’ll need to be sifted to remove the tiny hairs. Do you prefer to know how to make rose hip tea without the fuss? Try the following method, after buying a good brand of this tea, preferably organic, cut and sifted. Using one teaspoon of cut and sifted rose hips per cup of water, placed in a non-reactive saucepan which is then covered, brought to a boil and then simmered for 5 minutes. Alternatively, you can place the tea in a teapot and pour boiling water over it and steep for 10 minutes. Depending on the strength you like, place a teabag in your cup and pour boiling water over the tea, then steep for at least 5 minutes. You should cover the tea as it brews, to keep all the goodness from escaping. It’s better to enjoy this tea without milk, but you can add lemon, honey or a sweetener of your choice. You can try blending other herbals with rosehip tea, to enhance the flavor profile, like hibiscus, spearmint, stevia or cinnamon for an extra kick. This tea is one of the more delicious ways of enjoying a boost of Vitamin C, as a warm winter cup or delightful iced blend in the hot summer months. If you’re looking to buy Rosehip tea, you can likely find it in some local specialty stores, or you can even grab some from Amazon. Here are a couple of teas that are definitely worth ordering if you’re interested in trying something new, and looking for a high-quality product. 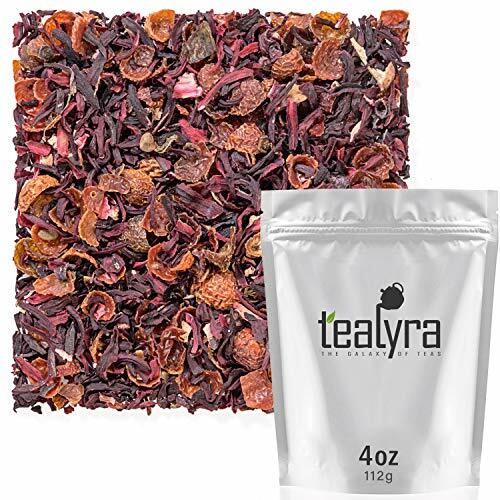 This one has the beautiful color and unique taste that you get from hibiscus tea, with all of the aforementioned benefits of rosehip tea – what’s not to like?